Bendigo Bank has a Monopoly! How do you get from Anzac Bridge to The Star in 3 seconds? 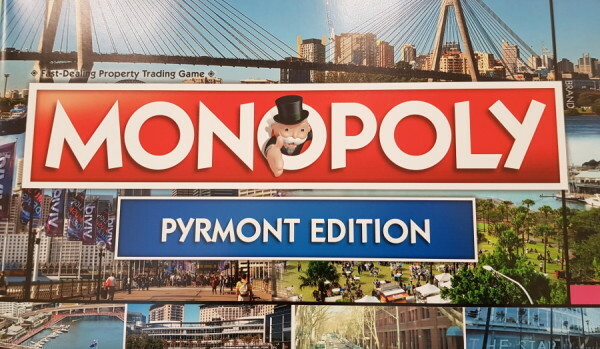 By moving your token on the Pyrmont Edition Monopoly board. Bendigo Bank Pyrmont are producing the customised edition of the classic game and inviting local businesses to be immortalised in the artwork or as one of the game elements. Major cities, retail chains, football clubs and more have all had bespoke versions of the game made and they’ve been great for promotion, gifts, and souvenirs. Garry Noel, Branch Manager at Bendigo Pyrmont, took on the project after seeing how enthusiastic businesses at other branch locations were. It’s quite an investment, but Noel believes it is worth it. It costs $90,000 to produce a customised version and receive 2000 units. There are twelve spots on the board available for sale at $5000 each. For $10,000 a business will also be represented by a custom token. The Star and Sydney Fish Market have both bought in at the higher price and will have a Star logo token and fish token respectively. There are opportunities to for brand mention in the Community Chest and Chance cards too, according to Noel. “For instance, a card might read: ‘Your insurance at Bendigo Bank Pyrmont has matured. Collect $100.’ Or ‘You successfully bid on a house at an auction through [XYZ Real Estate]. Pay $50,’” he explains. Each of the old familiar properties on the original game have been substituted with local landmarks. “Instead of Mayfair it’s gonna be The Star and instead of Park Lane it will be The Darling,” says Noel. The coloured lots will be comprised of three bridges, three bays, three parks, two quarries, three streets, three buildings and three wharves from around the precinct. Businesses are keen to be involved. “Pyrmont Bridge Hotel jumped at it,” says Noel. Matt Penfold and Genevieve Rechner of Kwik Kopy loved the idea and got on board (so to speak) very quickly. Once complete, the Pyrmont Edition Monopoly will have a big launch event at The Star. Representatives from Monopoly and all the businesses involved will be invited. The games will then be sold off at $60 each raising $120,000, all of which will be deposited in Bendigo Bank Community Enterprise fund and ultimately distributed to a local group or cause. You can see a mock up of the Pyrmont Monopoly box in the Bendigo Bank Pyrmont branch and either talk to staff there or contact Garry Noel at garry.noel@bendigoadelaide.com.au if you’d like to be involved. The first shipment arrives at the end of January. You can pre-order a game at this address: http://cwcfs.com.au/monopoly/ or wait until February and go into the Pyrmont branch of Bendigo Bank in Union Square and pick up a game there. It retails at $60. I would like to buy a Pyrmont Monopoly game, where can I purchase it?